The Kahr barrel begins its transformation from a solid round billet of proprietary, high tensile strength steel, 3 inches in diameter and 30 inches long. In the temperature-controlled environment of the Lothar Walther factory, the barrel stock is gun drilled and rifled to match grade tolerances. At the Kahr factory, the barrel stock is precisely cut to length and CNC machined. Nearly 75% of the solid steel billet is machined away to produce a single Kahr barrel. This intensive production method provides the greatest material integrity and tightest tolerances. It was chosen to ensure the best quality barrel possible. Kahr quality: unmatched at any price. The Kahr slide is made from 416 Stainless Steel bar stock and is also precision computer machined. This component is heat-treated and tempered to optimize durability. The combination of the engineering design, quality materials, and precise manufacturing results in the slide's toughness and compact size. Kahr's slide is the slimmest design among the major pistol brands. Kahr Arms is a revolutionary company committed to quality. One example of this dedication is the extreme lengths went to researching the material for the slide stop pin. A proprietary steel with unmatched toughness and elongation characteristics was selected after exhaustively surveying and testing numerous unique alloys. The material is so tough that grinding operations have to be employed in order to manufacture the part. Although the material and the manufacturing process greatly increase the cost of the part, Kahr believes that the resulting performance benefits vastly outweigh the expense incurred each time a pistol is assembled. This is just another example of Kahr's commitment to provide shooters with quality unmatched at any price. The Kahr magazine tube is constructed of corrosive resistant 400 series Stainless Steel and heat treated to 50 Rockwell for durability. Plasma-welding the stamping to form the magazine tube creates a smooth interior surface for the “ammunition stack” to rise and feed, joining the body by an “unbreakable” seam. During the finishing process the magazines is tumbled to provide a smooth, consistent burr-free surface. There are no sharp edges on which the shooter can be cut. Another feature unique to Kahr magazines is the steel slide stop pin contact insert in the magazine follower. This innovative insert assures that the follower will reliably engage the slide stop lever and lock the slide, magazine after magazine. With this feature the shooter does not have to be concerned about the inevitable wear that accompanies most plastic followers. Several U.S. Patents cover Kahr's unique locking, firing, and extraction systems. The incomparable cocking cam trigger system employs a cam to unlock the passive safety, finish cocking, and then release the firing pin. The system provides a safe and unbelievably smooth double action only trigger stroke that remains fast to fire in critical defensive situations. Kahr's patented "offset barrel" design places the trigger mechanism beside the barrel lug, raising the shooter's hand close to the center line of the bore. This (coupled with the ergonomically designed grips) results in a remarkable degree of shooting comfort and control, while reducing muzzle climb and felt recoil. A patented self-cleaning extractor is specially designed so that powder residue is forced away from the extractor, assuring that it will continue to function shot after shot. Furthermore, the extractor is designed so that it employs the slide itself to limit its movement. This means that failures to extract are nearly impossible. These innovations (found only in the Kahr pistol) give the shooter an advantage in critical self-defensive situations. The Kahr design and its quality manufacturing provide unmatched value in a compact handgun--especially important when your life depends on it. Utilizing the programming and tooling capabilities of CNC machining centers, Kahr pistols' main components are precision computer machined to the tightest universal tolerances. Machined parts are cut exactly to the engineering blueprint, assuring proper assembly and peak performance of every Kahr pistol. Quality is never compromised in either the assembly or testing of a firearm. Every Kahr pistol is made in accordance with the strictest international manufacturing standards and is individually tested at the adjoining firing range. The development of the Kahr handgun involved numerous testing sessions during which 10,000 rounds of ammunition were fired through a single pistol. Each Kahr model has been extensively tested to assure the reliability, function, accuracy, and safety of each component going into the final product. Any change in design has been rigorously tested to ensure absolute functioning. As a result of this exhaustive testing, Kahr has produced the most reliable compact firearm in the world today. 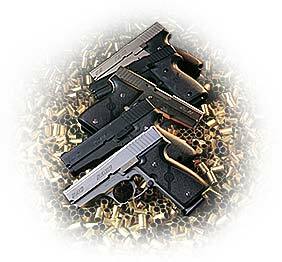 We at Kahr have total confidence in the durability and long-term reliability of our pistols. Kahr pistols are manufactured in Worcester, Massachusetts, in the region commonly known as "Gun Valley". Kahr workers are artisans in gun manufacturing who take pride in their fine workmanship. Kahr staff are team players in the true sense. 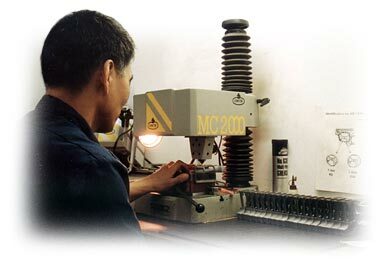 Due to cross-training in assembling and finishing, continuity of quality production is maintained in our factory. The quality-conscious Kahr staff is committed to assure shooter confidence in purchasing a Kahr firearm. Their expertise, work ethic, and serious dedication is reflected in the final product. Each Kahr pistol is backed by Kahr Arm's Five Year Limited Warranty. We stand by our product! 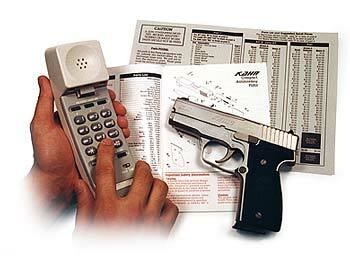 You may never need it, but Kahr's customer service is there for you. If you have a concern or need for service or a part, our customer service associates are friendly, and our trained technicians ready to assist you. The designer's first priority for the Kahr pistol was quality, and that is the final product. The union of advanced design, quality materials, and proper construction makes Kahr handguns the smallest, thinnest, most reliable full power compact pistols on the market. Kahr firearms carry a value unmatched at any price. Reliability. Unless the gun is 100% reliable, all else is meaningless. Kahr pistols have proven their reliability in testing by Federal, State, and local law enforcement agencies. Size. Ergonomically, the Kahr compact pistol excels. 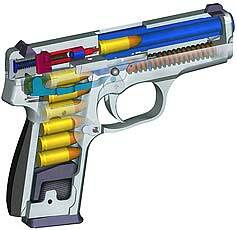 Each gun is easy to shoot well, and comfortable to carry for extended periods due to its thin profile. Power. Despite their diminutive size, Kahr pistols deliver full size ballistic performance in a compact sized package. So when it comes to protecting your life, choose the gun with unmatched value. Choose the gun stamped KAHR.